As cabinetmakers became more concerned with elements of design and new finishes, their concepts of wood selection and use also matured. Gone was the almost exclusive use of oak typical during the Jacobean period. The beauty and attractiveness of surface woods became more important, and walnut with its fine grain became the choice. Other woods having distinctive grain patterns, such as the figured maples and fruitwoods were also popular. In the best pieces veneers were employed to maximize surface beauty. Burl veneers, which were cut from the base of the tree near the root, were favored because of their wildly figured grain patterns. Hardware also changed, becoming decorative as well as functional. Teardrop shaped brass pulls and scrolled escutcheon plates were typical. As with all the Early American periods, there are two distinct styles of William and Mary furniture: that made in the cities, and the less elaborate «country» version. The country work was usually executed in maple, walnut, or cherry hardwood, with no veneer. Moldings were less elaborate and there was little or no inlay or edging. Scrollwork and turnings were less complicated, and the whole appearance of the piece was simpler. Here is a brief review of the major furniture forms. 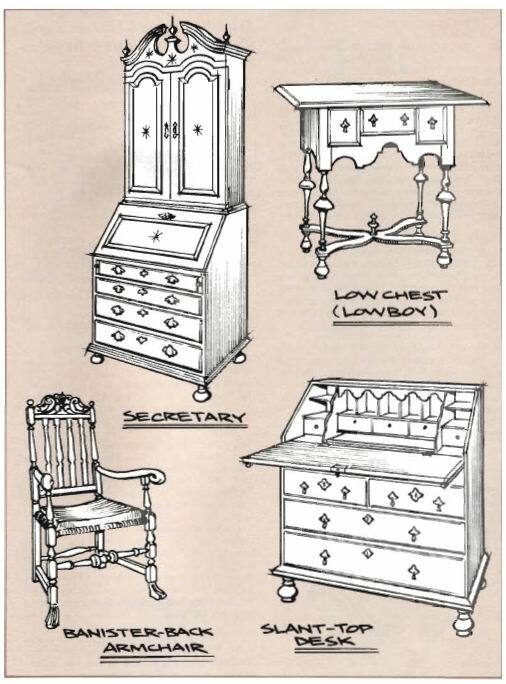 HIGH & LOW CHESTS: The appearance of «highboys» and «lowboys» (these terms actually became popular in the 19th Century) was the most significant new development in furniture form during the period. The highboy, which was essentially a chest of drawers elevated on turned legs, served chiefly for storage. The lowboy, with the top at table height, served as a dressing table. Lowboys usually had four turned legs and two crossed stretchers, while highboys rested on six legs joined with flat, scrolled stretchers. This entry was posted on Понедельник, Январь 9th, 2012 at 7:06 пп	and is filed under Furniture. You can follow any responses to this entry through the RSS 2.0 feed. Both comments and pings are currently closed.